2008-2009 was considered one of the most difficult year for equities but I probably quite a bit of profit in this past 6 months. 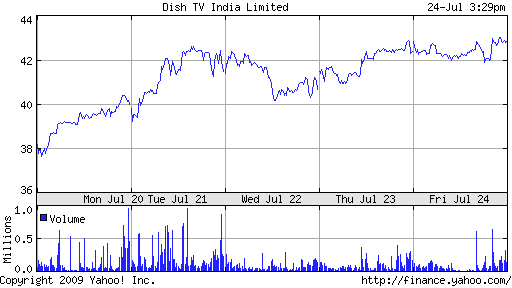 I am very bullish on DISH TV for almost last one year now and I have been investing over a longer period of time in DISH TV now. I started investing more In Aug 2008 and I bought 10,000 units of Dish TV at an average price of 19.92 ( including brokerage ) and then the stock hit a bottom of 12 but I had a stop loss of 8 and had the investment time frame of 2 years and a target price of 40 – 50. Screenshots are only of those days where I have purchased only DISH TV. I have not included the sale screenshot because I am still holding most of them. Now many people would argue that only people shows good looking screenshots and not the ones where they make losses. I would say when it comes to investing in Equity I also make losses no doubt but the above screenshots has also a second viewpoint. Oct – Dec 2008 was considered as the worst months in the equity investment arena and so if you dare to invest in that time frame you can really make some good money and I did that and so I am showing as of now to inspire people. Now my first target of range of 40-50 is met and now I am offloading the investment to an extent as well as holding on to them to the next target of yet doubling the money.